1. Introduction: General definitions and the origin of the soils. 2. Weight-Volume Relations: Phase diagram, void ratio, porosity, water content, degree of saturation, density and unit weight relationships. 3. 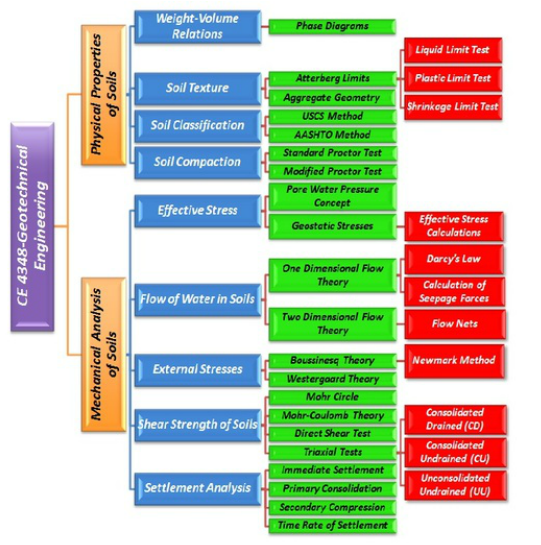 Soil Texture and Classification: Particle size distribution, shape factors, liquid limit, plastic limit, plasticity index, shrinkage limit, plasticity charts, USCS and AASHTO classification. 4. 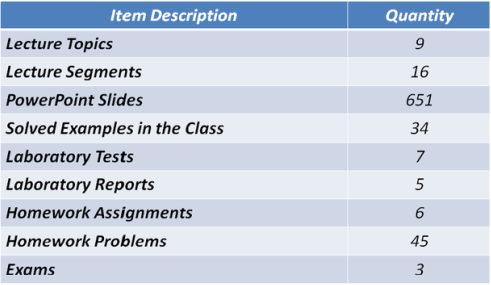 Compaction: Standard and modified proctor test, factors influencing compaction, moisture-density curves, macro-structure of compacted cohesive clays. 5. Geostatic Stresses: Effective stress and pore water pressure concept, calculation of effective and total stress in single layer and multi-layer soils, effect of change in water table. 6. Hydraulic Conductivity and Seepage: Darcy’s law, hydraulic conductivity, pumping wells, flow nets, and seepage calculation. 7. External Stresses in Soils: Calculation of stresses due to point load, strip load, circular and rectangular area loads, Boussinesq theory, and influence charts. 8. Shear Strength of Soils: Mohr-Coulomb failure criteria, laboratory test for determination of shear strength parameters, triaxial test, and direct shear test. 9. Consolidation: Consolidation theory, OCR, void ratio-effective pressure plots, normally consolidated and over consolidated soils, compression index, swell index, secondary consolidation, and time effect.